I was born in Mount Pleasant, South Carolina. But, growing up my family moved 5 times before landing in Chattanooga. How long have you lived in Chattanooga? It was fabulous. I wish I could go back to it sometimes. Life was carefree and the simplest things were riveting. When were you introduced to Yoga? 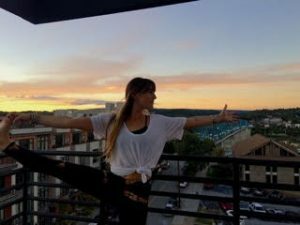 euphoric and knew I couldn’t live without this “yoga” thing in my life. How do yoga and the community play a role in your life? Yoga is more than just the physical practice, it also shapes a persons character and mindset. With that, the people who practice yoga are incredible people. Having the positivity and light from those in the yoga community only brings me more love to continue to spread. What pose do you love the most and why? I don’t have just one pose I love the most at one given time. It changes like the seasons. 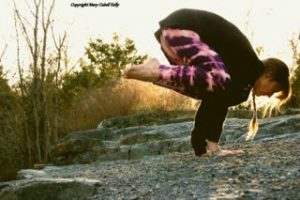 But, right now I am particularly fond of uttanasana / standing forward fold , with really bent knees. It feels like heaven.